Shawn comes from a long family line of artists and has a passion for many different art forms. She has been teaching many different skills set over the years and loves to lend a helping hand. Shawn teachers her students with great care and treats everyone like she has known them for a lifetime. Come join us in learning a skill that has been around for ages. This classic beauty never goes out of style. We will be teaching you the original knotting used for pearls, that we now use for all different beads. 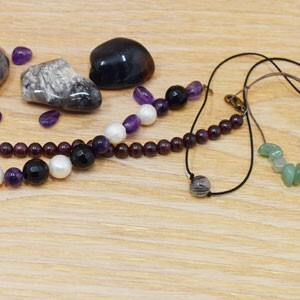 We will be making one bracelet, using sterling silver findings, silk cord, and your choice in beads. Feel free to bring in your own jewelry that has broken, or has stretched out. We will not fix them in the class but we can show you what needs to be done and offer different suggests.